About a year ago I showed my good friend Bill Ausich (The Ohio State University) hundreds of crinoid pieces from the Matmor Formation (Jurassic, Callovian) exposed in Hamakhtesh Hagadol, southern Israel. We knew the crinoid represented by all these pieces belonged to the genus Apiocrinites Miller, 1821, but we could not place the species. Bill, crinoid genius that he is, then figured out this was a new species. We now have the pleasure of introducing Apiocrinites negevensis Ausich & Wilson, 2012. This species of Apiocrinites, the first described from Jurassic tropical latitudes, is distinguished by features in its calyx (or crown or head). A. negevensis has a narrow radial facet and adjacent arms are not in lateral contact. It also has large aboral cup plates. (And it is gorgeous.) In the above image from Figure 1 of our paper, the A. negevensis holotype is shown as 1-3; 1 is a lateral view, radial plate missing from either side of the single preserved radial plate; 2, radial facet; 3, inside of cup with cavity extending to proximale; 4, a partial cup with proximale, one complete and one broken basal plates, and one broken radial plate (note numerous barnacle borings, Rogerella Saint-Seine, 1951, on this specimen). Apiocrinites negevensis parts in the field (Matmor Formation, Hamakhtesh Hagadol, southern Israel). See this post for a discussion of our fieldwork. The taxonomic category we know as the Crinoidea was established in 1821 by J.S. Miller, who separated the stalked echinoderms from all the others. At the same time he erected the genus Apiocrinites. Cover of Miller’s 1821 book describing the crinoids, including the new Apiocrinites. 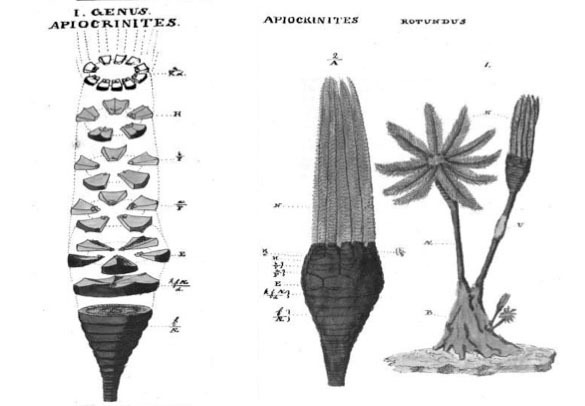 Miller’s (1821) illustrations of Apiocrinites. Ausich, W.I. and Wilson, M.A. 2012. 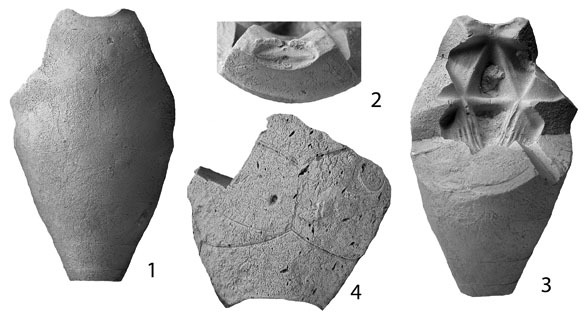 New Tethyan Apiocrinitidae (Crinoidea; Articulata) from the Jurassic of Israel. Journal of Paleontology 86: 1051-1055. Feldman, H.R. and Brett, C.E. 1998. 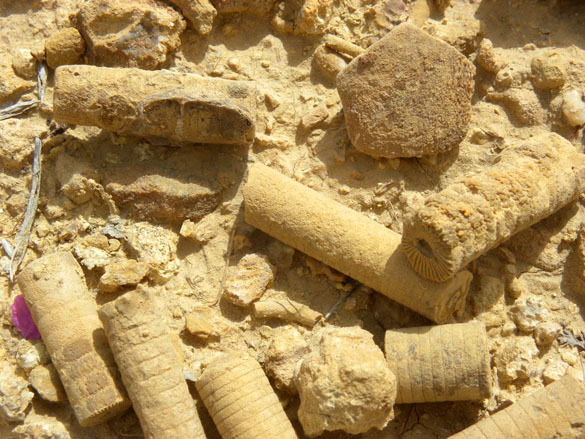 Epi- and endobiontic organisms on Late Jurassic crinoid columns from the Negev Desert, Israel: Implications for co-evolution. Lethaia 31: 57-71. Miller, J.S. 1821. 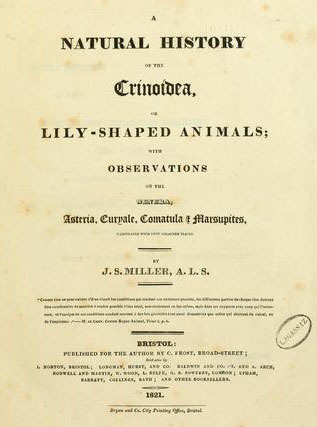 A natural history of the Crinoidea or lily-shaped animals, with observation on the genera Asterias, Euryale, Comatula, and Marsupites. Bryan & Co, Bristol, 150 pp. Wilson, M.A., Feldman, H.R., Bowen, J.C. and Avni, J. 2008. A new equatorial, very shallow marine sclerozoan fauna from the Middle Jurassic (late Callovian) of southern Israel. Palaeogeography, Palaeoclimatology, Palaeoecology 263: 24-29. I love this post. Crinoids!!!! !